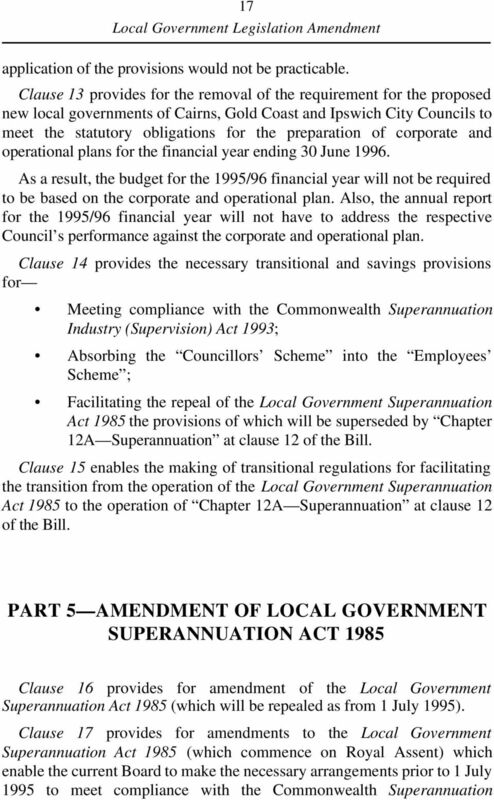 Download "LOCAL GOVERNMENT LEGISLATION AMENDMENT BILL 1995"
4 4 enterprise will be required to meet superannuation contributions under the Commonwealth Superannuation Guarantee (Administration) Act 1992 on behalf of its employees or directors (as the case may be). Such a body may also wish to extend to employees or directors, superannuation benefits above those required under the superannuation guarantee legislation. 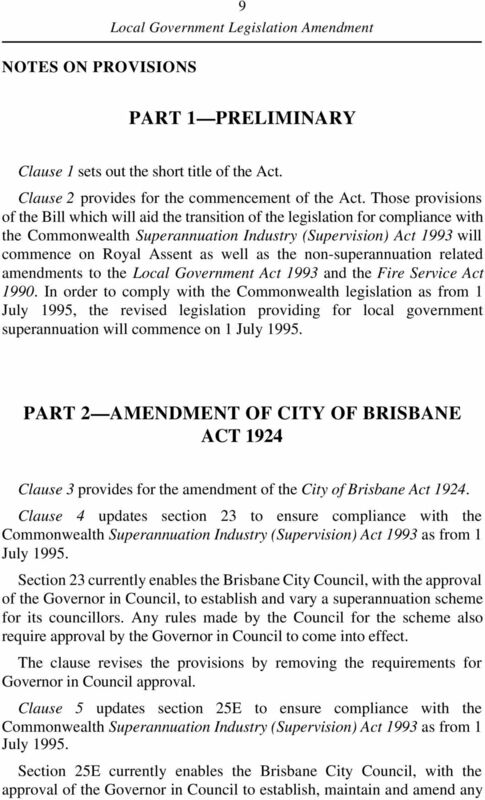 As the operating environment in which local governments operate has significantly changed under the Local Government Act 1993, the conditions for bodies to participate in the scheme administered by the Queensland Local Government Superannuation Board have been reviewed and extended to also enable an entity prescribed by regulation which exclusively exercises a local government power for a local government to be able to contribute to the Local Government Superannuation Scheme. (c) Absorbing the Councillors Scheme into the Employees Scheme Presently, the Queensland Local Government Superannuation Board administers and acts as trustee of two superannuation schemes, namely: Local Government Employees Superannuation Scheme (Employees Scheme) The Scheme provides for a defined benefit fund for permanent employees of local government and an accumulation fund for casual employees. The Local Government Superannuation Act 1985 provides the legislative framework for the establishment of the scheme, the contributions to the scheme, the constitution of the Board, the Board s powers and eligibility for employees to join the scheme. It is compulsory for local governments to contribute to this scheme for their employees. 5 5 Local Government (Relevant Persons) Plan (Councillors Scheme) This is an accumulation scheme established by regulation under the Local Government Superannuation Act 1985 specifically for those councillors for whom a local government wishes to extend superannuation benefits under the Local Government Act The scheme is also for those contractors to local government who are subject to the Commonwealth Superannuation Guarantee (Administration) Act It is not compulsory for local governments to contribute to this particular scheme for Superannuation Guarantee or Local Government Act purposes. However, contributions are to be made to a fund which complies with Commonwealth Superannuation legislation. As some councillors and contractors have private superannuation schemes, local governments can choose to pay contributions to the person s private scheme rather than the scheme administered by the Queensland Local Government Superannuation Board. It is considered desirable to rationalise the Board s management of schemes for which it acts as trustee. The Bill therefore absorbs the Councillors Scheme into the Employees Scheme. The management of one scheme for councillors and employees will also result in administrative savings for the Board. (d) General updating and removal of redundant or offending provisions Many provisions in the Local Government Superannuation Act 1985 are no longer applicable, have become redundant, potentially offend the Anti- Discrimination Act 1991 or are more appropriately dealt with in the trust deed of the scheme. The Bill therefore revises the provisions to conform with contemporary superannuation arrangements. 6 6 2. Other Matters (a) Disposal of Land and Goods The Local Government Act 1993 (section 405) provides that a local government can dispose of land and also goods (with an apparent value of at least $1000) by public auction or through a competitive tendering process. Where a local government does not wish to hold an auction or call for tenders, it can apply for exemption from the Minister (under section 406). As the provisions currently stand, it is unclear as to whether the Minister can grant the exemption subject to conditions, e.g. where the disposal is proposed to be to a specific charitable organisation, a condition could be imposed to ensure only that charitable organisation could be the recipient of the goods or land (as the case may be). To put the intent of the provisions beyond doubt, it is proposed to clarify that an exemption can be given by the Minister subject to conditions. (b) Suspension of Corporate and Operational Planning Requirements The Local Government Act 1993 requires local governments to prepare and adopt a corporate plan and an operational plan for the financial year commencing 1 July 1995 and for each financial year thereafter. In this respect, the operational plan must address the methods by which the objectives of the corporate plan are to be achieved. 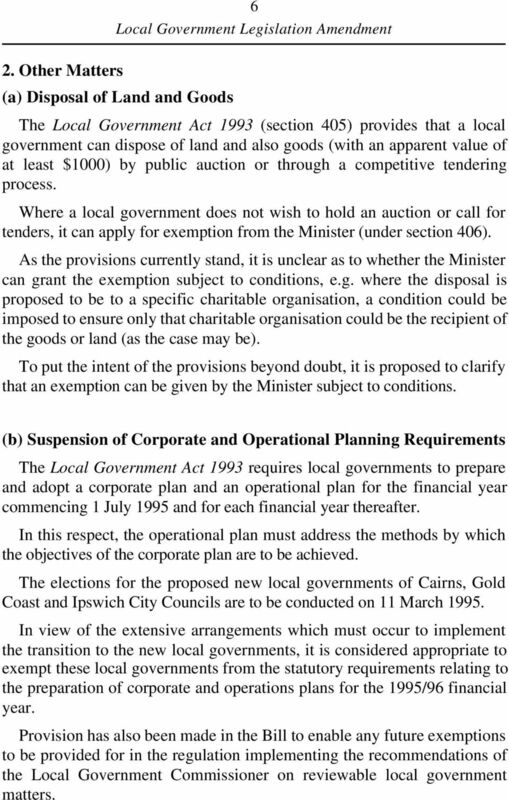 The elections for the proposed new local governments of Cairns, Gold Coast and Ipswich City Councils are to be conducted on 11 March In view of the extensive arrangements which must occur to implement the transition to the new local governments, it is considered appropriate to exempt these local governments from the statutory requirements relating to the preparation of corporate and operations plans for the 1995/96 financial year. Provision has also been made in the Bill to enable any future exemptions to be provided for in the regulation implementing the recommendations of the Local Government Commissioner on reviewable local government matters. 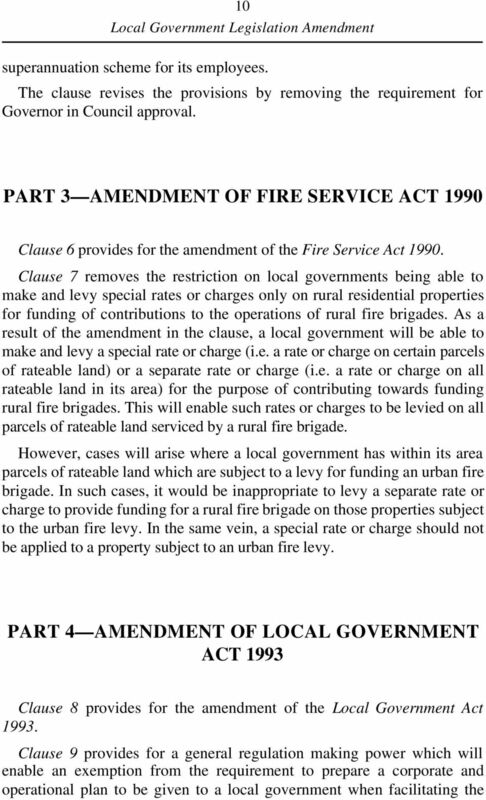 7 7 (c) Funding for Rural Fire Brigades The Fire Service Act 1990 enables a local government to make and levy a special rate or charge (i.e. a rate or charge on certain parcels of rateable land) or a separate rate or charge (i.e. a rate or charge on all rateable land in its area) for the purpose of contributing towards funding rural fire brigades. However, the Act limits the making and levying of special rates or charges to land which a local government considers to be rural residential land. Difficulties are being experienced by some local governments when determining which parcels of land are rural residential. Certain parcels of land which are serviced by a rural fire brigade are also not leviable by a special rate or charge as it is not considered rural residential land, e.g. certain urban style townships in rural areas. To relieve the problems being experienced, the Bill provides for the removal of the limitation placed on local governments in relation to making and levying special rates or charges on rural residential land. 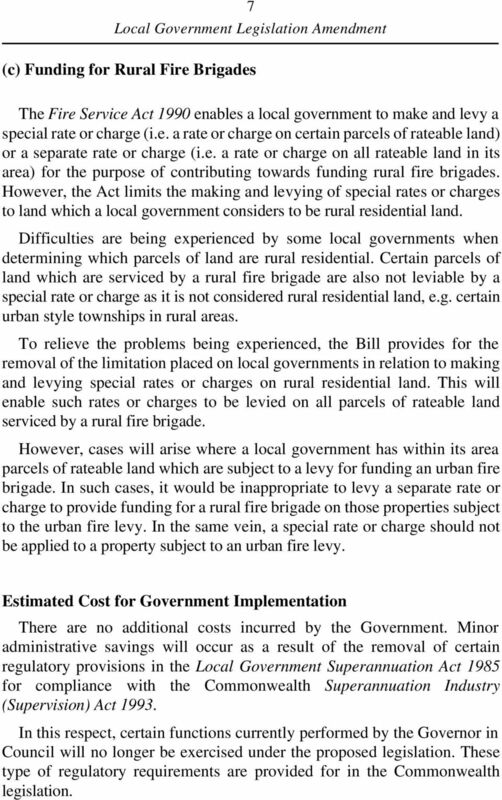 This will enable such rates or charges to be levied on all parcels of rateable land serviced by a rural fire brigade. However, cases will arise where a local government has within its area parcels of rateable land which are subject to a levy for funding an urban fire brigade. In such cases, it would be inappropriate to levy a separate rate or charge to provide funding for a rural fire brigade on those properties subject to the urban fire levy. In the same vein, a special rate or charge should not be applied to a property subject to an urban fire levy. Estimated Cost for Government Implementation There are no additional costs incurred by the Government. Minor administrative savings will occur as a result of the removal of certain regulatory provisions in the Local Government Superannuation Act 1985 for compliance with the Commonwealth Superannuation Industry (Supervision) Act In this respect, certain functions currently performed by the Governor in Council will no longer be exercised under the proposed legislation. These type of regulatory requirements are provided for in the Commonwealth legislation. 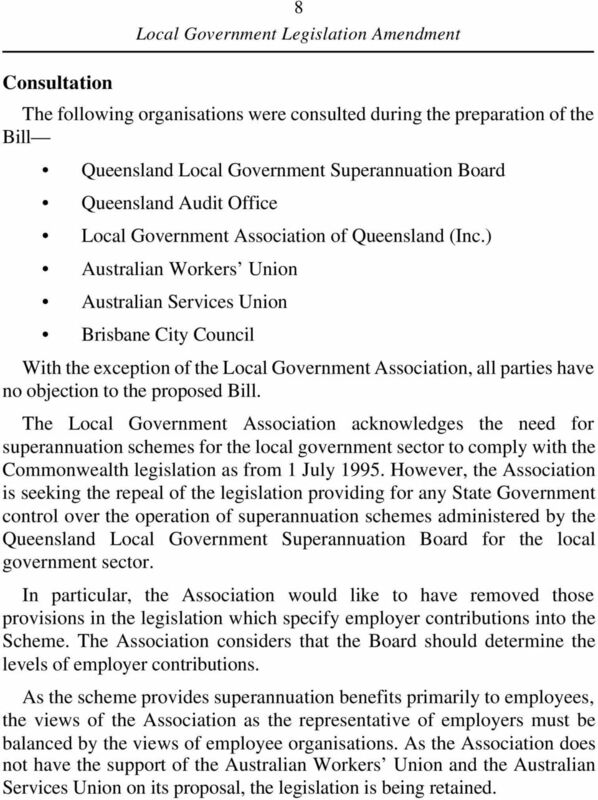 8 8 Consultation The following organisations were consulted during the preparation of the Bill Queensland Local Government Superannuation Board Queensland Audit Office Local Government Association of Queensland (Inc.) Australian Workers Union Australian Services Union Brisbane City Council With the exception of the Local Government Association, all parties have no objection to the proposed Bill. 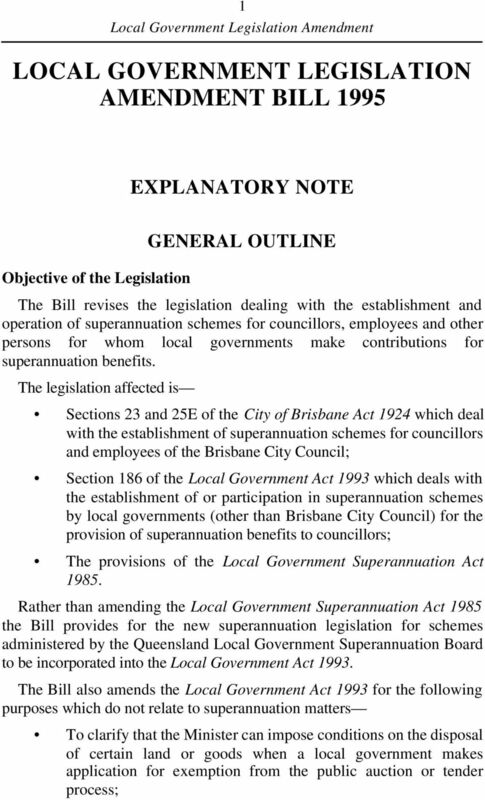 The Local Government Association acknowledges the need for superannuation schemes for the local government sector to comply with the Commonwealth legislation as from 1 July However, the Association is seeking the repeal of the legislation providing for any State Government control over the operation of superannuation schemes administered by the Queensland Local Government Superannuation Board for the local government sector. In particular, the Association would like to have removed those provisions in the legislation which specify employer contributions into the Scheme. The Association considers that the Board should determine the levels of employer contributions. As the scheme provides superannuation benefits primarily to employees, the views of the Association as the representative of employers must be balanced by the views of employee organisations. As the Association does not have the support of the Australian Workers Union and the Australian Services Union on its proposal, the legislation is being retained. 11 11 implementation of recommendations of the Local Government Commissioner on reviewable local government matters. 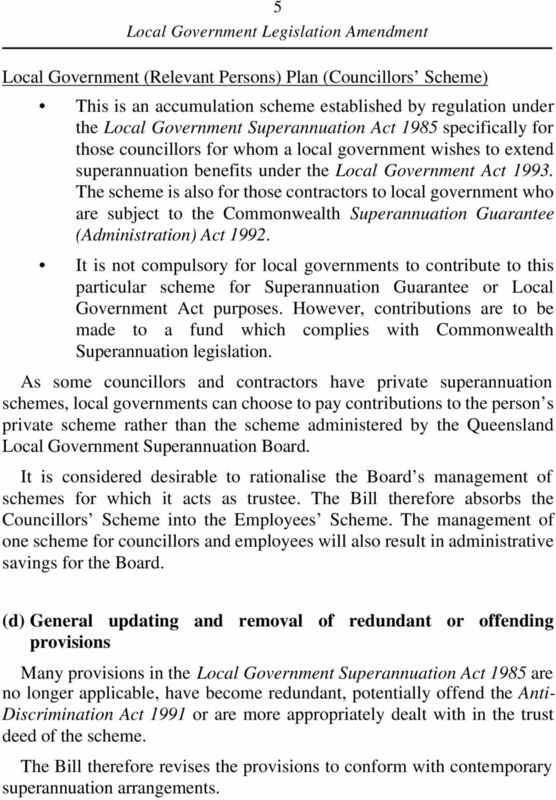 Clause 10 clarifies section 186 and also updates the section for compliance with the Commonwealth Superannuation Industry (Supervision) Act 1993 as from 1 July Section 186 of the Local Government Act 1993 provides a discretion for a local government to establish or take part in a superannuation scheme for the benefit of its councillors. 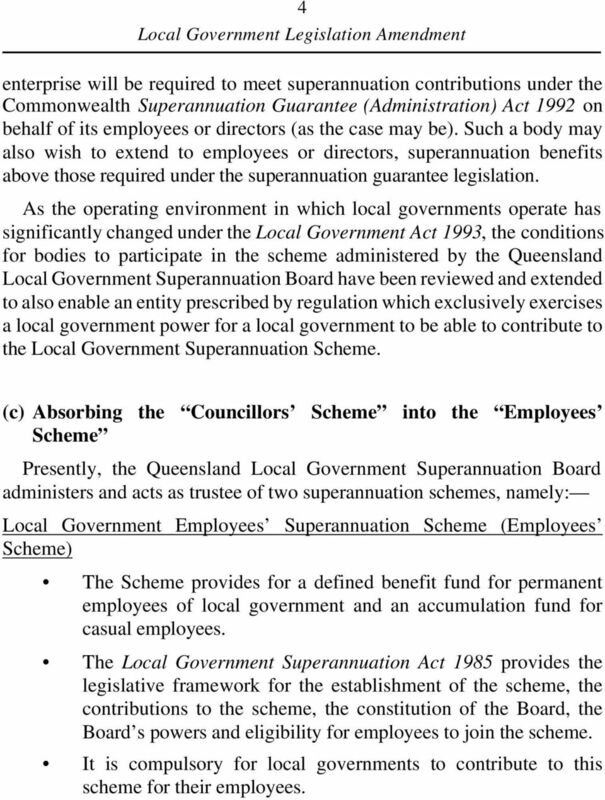 Where a local government establishes a scheme it must make rules for the scheme which comply with the Commonwealth Occupational Superannuation Standards Act 1987 (the requirements of which are now provided for by the Superannuation Industry (Supervision) Act 1993). The rules are also required to be approved by the Governor in Council. 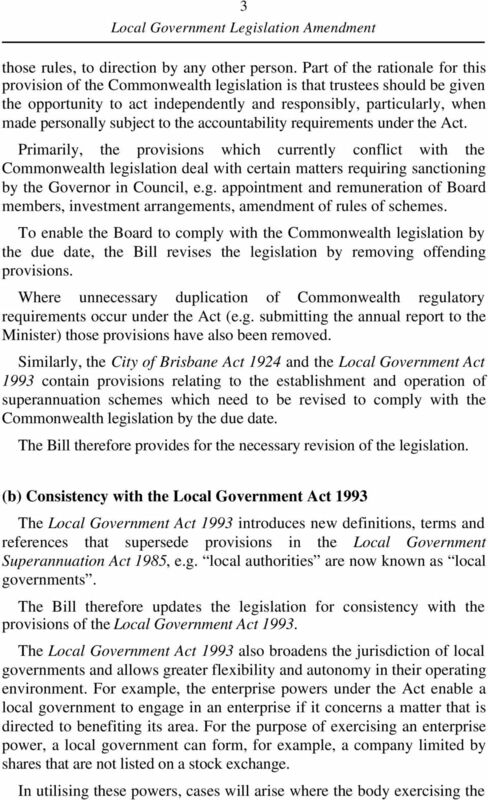 To accord with the Commonwealth legislation, the clause removes the provisions relating to approval of rules by the Governor in Council. The clause also revises the section to make its intention clear with respect to the levels of contribution which a local government can make in relation to its councillors. 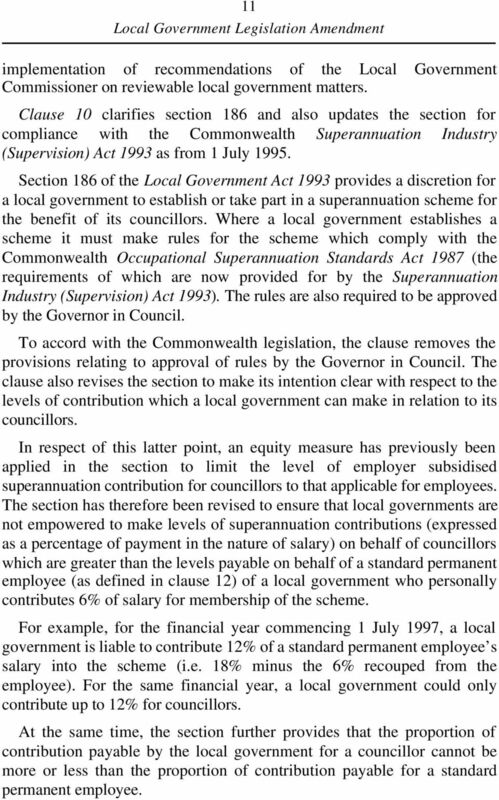 In respect of this latter point, an equity measure has previously been applied in the section to limit the level of employer subsidised superannuation contribution for councillors to that applicable for employees. 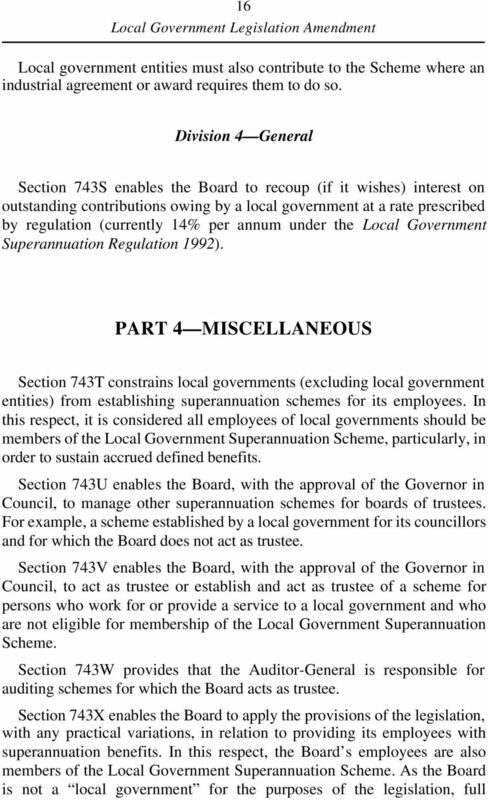 The section has therefore been revised to ensure that local governments are not empowered to make levels of superannuation contributions (expressed as a percentage of payment in the nature of salary) on behalf of councillors which are greater than the levels payable on behalf of a standard permanent employee (as defined in clause 12) of a local government who personally contributes 6% of salary for membership of the scheme. For example, for the financial year commencing 1 July 1997, a local government is liable to contribute 12% of a standard permanent employee s salary into the scheme (i.e. 18% minus the 6% recouped from the employee). For the same financial year, a local government could only contribute up to 12% for councillors. At the same time, the section further provides that the proportion of contribution payable by the local government for a councillor cannot be more or less than the proportion of contribution payable for a standard permanent employee. 12 12 For example, for the financial year commencing 1 July 1997 the total contribution for an employee is 18% of salary. The local government s proportion is 12% and the standard permanent employee s proportion is 6%. A ratio of 12:6 therefore exists for these employees with the local government contributing two thirds of the total contribution. Under the provisions, a local government can therefore contribute any lesser percentage of contribution as long as the proportion of employer to employee contribution is not disrupted, that is, for example, ratios of 12:6, 9:4.5, 6:3 could apply in respect of contributions to be made by the local government and the councillor. In all of these cases, the local government would contribute two thirds of the total contribution and the councillor would contribute one third. The proportion has therefore not changed. Clause 11 clarifies that the Minister can impose conditions on the disposal of certain land and goods when a local government makes application for exemption from the public auction or tender process. 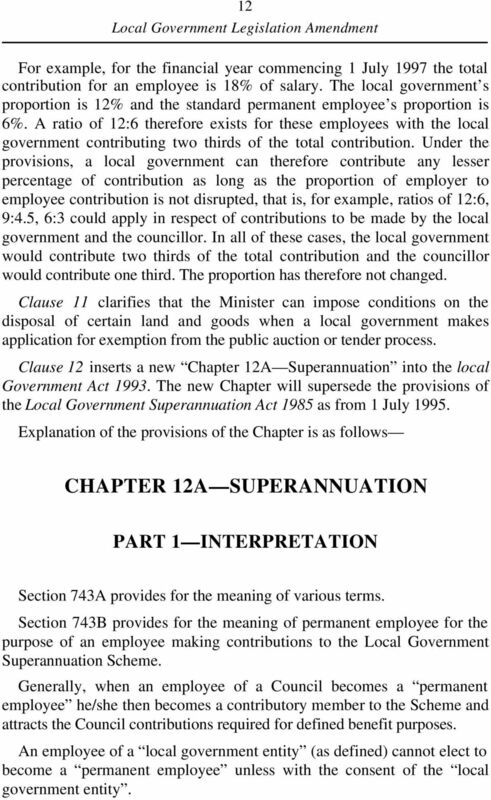 Clause 12 inserts a new Chapter 12A Superannuation into the local Government Act The new Chapter will supersede the provisions of the Local Government Superannuation Act 1985 as from 1 July Explanation of the provisions of the Chapter is as follows CHAPTER 12A SUPERANNUATION PART 1 INTERPRETATION Section 743A provides for the meaning of various terms. Section 743B provides for the meaning of permanent employee for the purpose of an employee making contributions to the Local Government Superannuation Scheme. Generally, when an employee of a Council becomes a permanent employee he/she then becomes a contributory member to the Scheme and attracts the Council contributions required for defined benefit purposes. An employee of a local government entity (as defined) cannot elect to become a permanent employee unless with the consent of the local government entity. 13 13 If an employee is not a permanent employee he/she would continue to be a non-contributory member (as defined). In such cases, the employer would only need to pay those contributions required under an industrial arrangement or an Act (e.g. Superannuation Guarantee payments) on behalf of the employee. 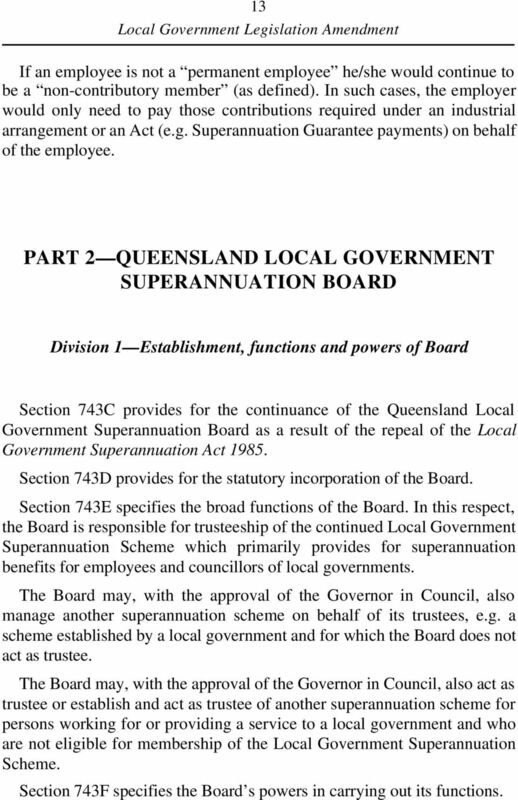 PART 2 QUEENSLAND LOCAL GOVERNMENT SUPERANNUATION BOARD Division 1 Establishment, functions and powers of Board Section 743C provides for the continuance of the Queensland Local Government Superannuation Board as a result of the repeal of the Local Government Superannuation Act Section 743D provides for the statutory incorporation of the Board. Section 743E specifies the broad functions of the Board. In this respect, the Board is responsible for trusteeship of the continued Local Government Superannuation Scheme which primarily provides for superannuation benefits for employees and councillors of local governments. The Board may, with the approval of the Governor in Council, also manage another superannuation scheme on behalf of its trustees, e.g. a scheme established by a local government and for which the Board does not act as trustee. 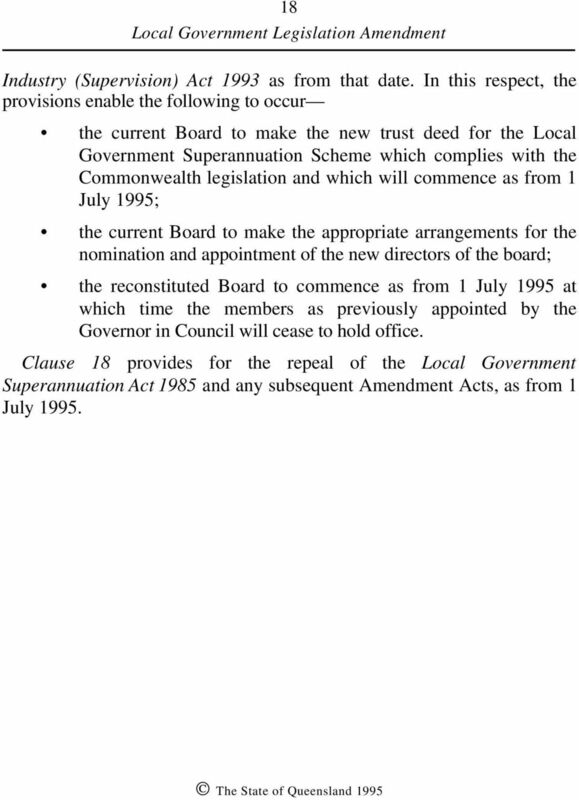 The Board may, with the approval of the Governor in Council, also act as trustee or establish and act as trustee of another superannuation scheme for persons working for or providing a service to a local government and who are not eligible for membership of the Local Government Superannuation Scheme. Section 743F specifies the Board s powers in carrying out its functions. 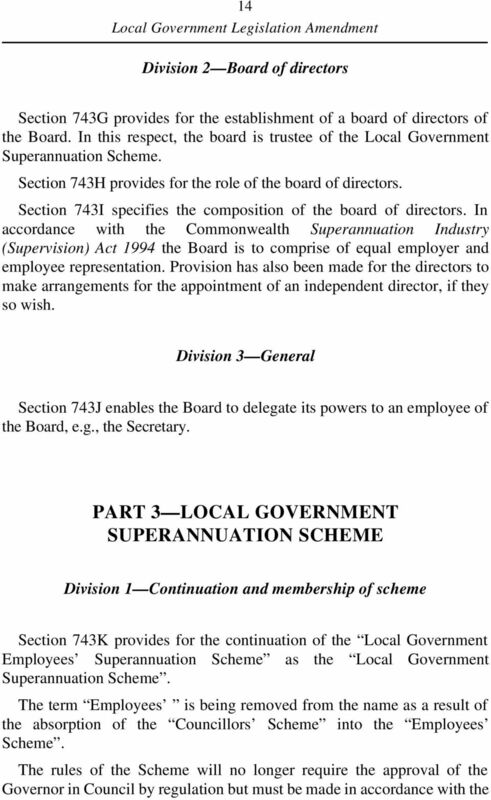 15 15 Commonwealth Superannuation Industry (Supervision) Act Section 743L specifies those categories of people who are eligible for membership or who must be members of the Scheme. Division 2 Contributions for permanent employees Section 743M specifies the rates of compulsory annual employer contributions into the Scheme for those employees who make the statutory contributions under section 743N. In this respect, the employer makes both the employer and employee contributions to the Scheme and later recoups the employee contribution from the employee. 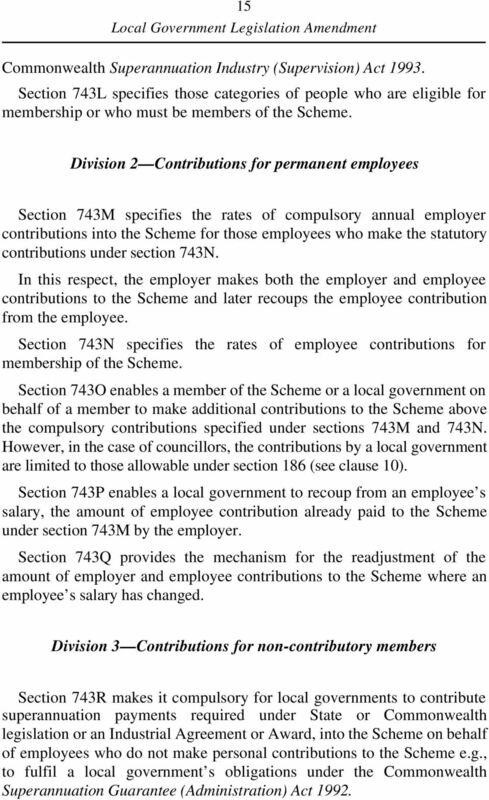 Section 743N specifies the rates of employee contributions for membership of the Scheme. Section 743O enables a member of the Scheme or a local government on behalf of a member to make additional contributions to the Scheme above the compulsory contributions specified under sections 743M and 743N. However, in the case of councillors, the contributions by a local government are limited to those allowable under section 186 (see clause 10). Section 743P enables a local government to recoup from an employee s salary, the amount of employee contribution already paid to the Scheme under section 743M by the employer. Section 743Q provides the mechanism for the readjustment of the amount of employer and employee contributions to the Scheme where an employee s salary has changed. 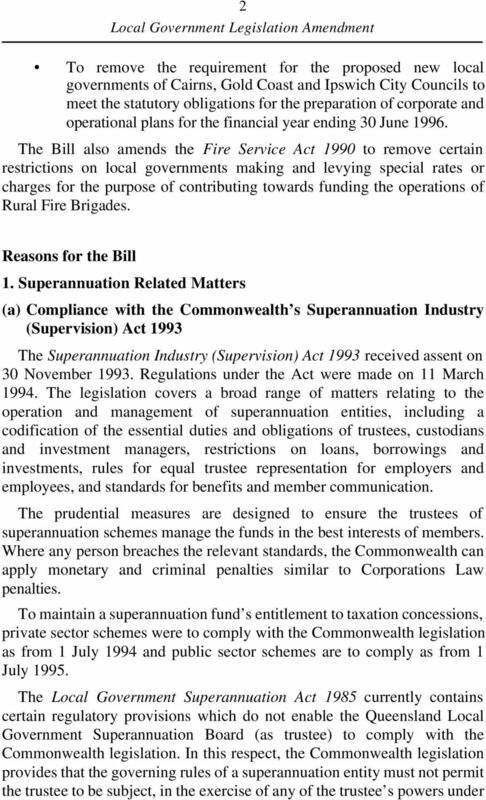 Division 3 Contributions for non-contributory members Section 743R makes it compulsory for local governments to contribute superannuation payments required under State or Commonwealth legislation or an Industrial Agreement or Award, into the Scheme on behalf of employees who do not make personal contributions to the Scheme e.g., to fulfil a local government s obligations under the Commonwealth Superannuation Guarantee (Administration) Act 1992. Public Trustee (Fees & Charges Notice) (No.1) 2015. Public Trustee Act 1978, section 17 PUBLIC TRUSTEE (FEES AND CHARGES NOTICE) (NO.